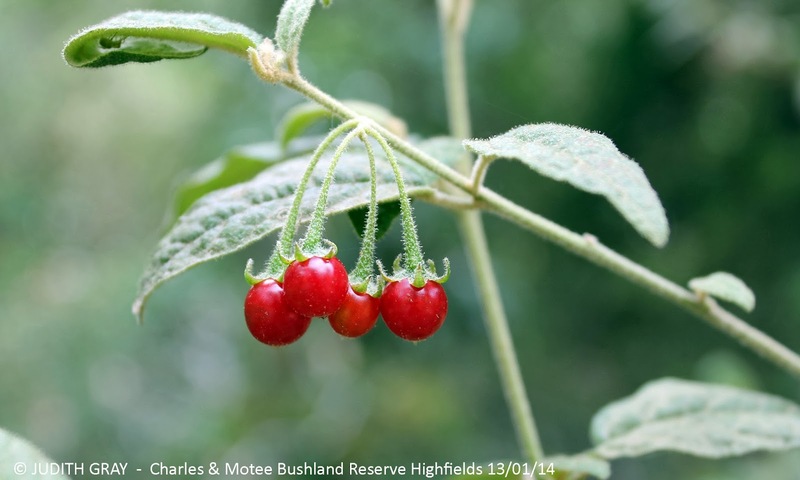 These vibrant red berries caught my eye at the Charles and Motee Rogers Bushland Reserve in January 2014. I photographed them but required an i.d. Thanks to Greg Lukes for helping out with an identification of Devils Needles (Solanum stelligerum). This native shrub is found on rainforest edges and eucalyptus forests. Stems are prickly and leaves often alternate with spines. Mauve flowers are present in spring to summer followed by the red fruit (see below). Devils Needles shrubs are prominent on the southern side of the Charles and Motee Rogers Bushland Reserve along the edges of the Nature Trail.